22	First Class: All Aboard the Orient Express! I don’t have to be back to work until Thursday at 8 am. I have decided that if I spend three days working on Midsummer Night’s Dream, I’ll rush it and screw something up. If I spend 3 days learning to play Scythe or another board game, I’ll drive myself crazy and start missing rules and rushing… and stressing. So I’m going to do both with the understanding that I won’t finish either one and that’s ok. But three whole days! So awesome… I think I’ll take a nap now. Taking Mom to the emergency room again. Had to call in to work. My bedroom is a forest. My living room is orange. I used to count down my posts- I don’t any longer because I passed zero awhile back and I no longer have any idea what day it would be. Other than that, it’s Monday, Ocotober 1st which means it’s the start of my favorite season- Autumn! My schedule is still insane- I never know when I will have a day off and I never have a day off from family duties which just get more and more instead of eventually decreasing. It’s depressing. So, instead of talking about that, I’m going to talk about books- a much more cheerful subject. I’ve started the rebind of the last of the Oz books- yay!- which means I’ll be moving on to Midsummer Night’s Dream fairly soon. I’m excited about that! I’m having just a bit of trouble with Oz however- the last few books, when I’ve taken it out of the press, the first few and the last few pages have been wrinkled as though they were water damaged. WTF? This last one, I’m going to wrap the text block in wax paper and see if I can prevent that from happening. Possibly my paste for the case is too wet… or I should make the case AND LET IT DRY before casing the text block. I’ll do that with Midsummer Night’s Dream as well as I would hate to ruin the text block and mulberry paper… although I will not be affixing the prints into the book until after it’s bound- likewise the tissue protectors for the prints. This will allow me to center the prints in the bound book instead of trying to guess how far from each edge they should be. In other book news, recent additions to the library are a full set of Easton Press Little House books- I wanted that set in particular because of the spine decoration that spans all nine books. They also did not screw anything up and included all the text and pictures by Garth Williams which I prefer. Also a copy of THE ROMANCE OF TRISTRAM OF LYONES & LA BEALE ISOUDE illuminated by Evelyn Paul. It’s going to have to have a sleeve as the leather binding has small nails in it which will rip other books on the shelf but I won’t mess with it other wise. I’d almost like to- it’s rough cut on two edges… very rough on the bottom… and that bothers me a bit. And, though it is not here yet, Legacy and other poems by Madeline Caron Rock. “Book Description: Small tall 8vo; small hand-made book, with simple illuminated decoration, designed and printed by SIDNEY FARNSWORTH at the Chelmsford School of Art, consisting of: 2 blank leaves, decorated title page, 9 leaves of text, colophon, three blank leaves; printed single-sided in black, with red and blue hand-colouring to lettering and decoration on title, red and gilt hand-colouring to decoration and lettering devices on text page, one red hand-coloured lettering device on colophon; printed on hand-made paper (with windmill water-mark), uncut, hand-bound with plain white card covers; contents very good throughout, cover badly split on spine; contained within two plain dust-wrappers made from cartridge paper (one red, one purple, each with a device printed in gilt designed from the author’s initials) inner wrapper split at bottom of backstrip but otherwise good, outer wrapper rather worn and split on folds and edges, with slight loss, but almost complete. A charming and attractive little work produced by Sidney Farnsworth, (who was later -1920 – to produce a well-regarded book about illumination). There is no indication as to the number of copies produced of this book. It could be one of a very few copies, or it could even be unique” I doubt I will mess with this one either although I may make it a box to protect it as the covers look quite fragile. And a project book- The Hole and Corner book by B Parker and N Parker. “Book Description: Hardcover copy in fair condition. Binding is intact, though very much damaged. An excellent restoration project for a stunningly handsome book. ” It is too- those chromolithographs got me- and I think I will give it a leather binding with the front cover illustration inset- maybe similar to a large Cosway binding if I can figure out how to do it. Other projects include 1849 ILLUMINATED EDITION OF SHAKESPEARE’S BALLADS which needs to be (carefully!) mended- it needs a spine and Little Women- which I will have to print because it has been heavily edited from the first edition. I’m going through and de-editing it as well as adding the black and white pictures I want and pages to attach the Norman Rockwell pictures. I’ll have prints made from the magazines they were originally in and affix those into the book. So that’s what’s going on in the library right now…. 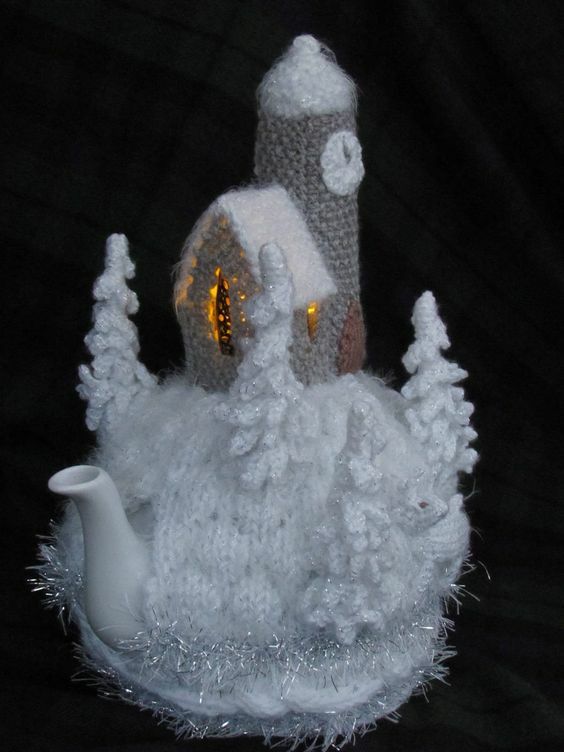 This was my first tea cosy, before I dialed in exactly what I wanted. 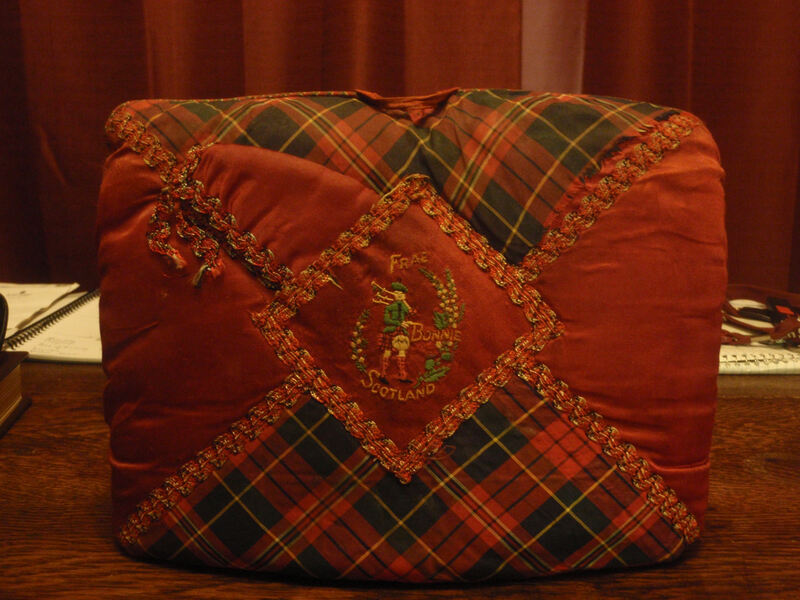 It’s a souviner from Scotland with embroidery on the front and ‘Frae Bonnie Scotland” embroidered around the highland piper. 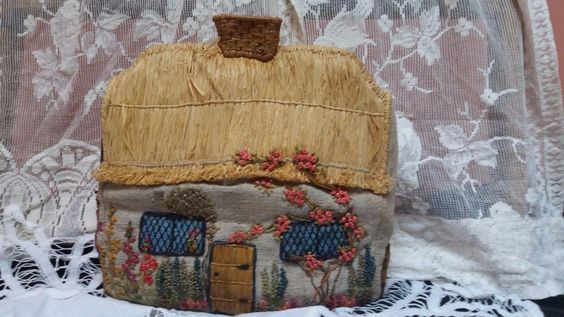 The embroidery is a pocket and there’s a small ‘hat’ in it- which I have discovered is a potholder for the teapot handle- clever! I would guess this is midcentury or so although it could be earlier. 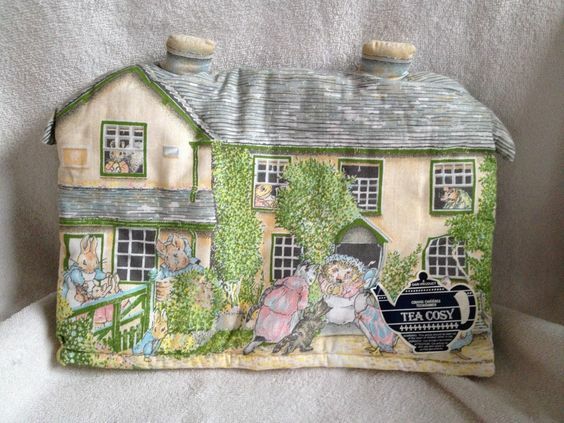 This one is really for Emily- I like the more elaborate cottages… but it’s Beatrix Potter and it’s a cottage, if printed rather than embroidered, so we got it. Tag says that it’s a Sari design. Hello, cat. Not a cottage at all but how can you resist the expression on that face? We can’t use it much though because when we set it up on the table, we’re always forgetting and yelling ‘Cat!’ which, of course, upsets the cats who were not doing anything wrong (at the moment). Tag on the inside says that it’s a Sari design as well. This is called Winter Wonderland and the pattern is available on Etsy. Since I am not much of a knitter, I contracted someone else to knit the pattern for me… and make the deer and birds brown so they can be better seen. So far, it’s my most expensive one- which is funny as I generally do not like the knitted/crocheted cosies. It also just barely fits into the parameters of what I decided to collect. 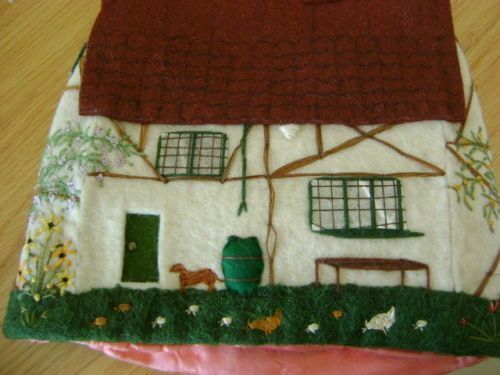 My latest cosy (as of May 2018)- another Inn- this one is obviously the Red Lion. 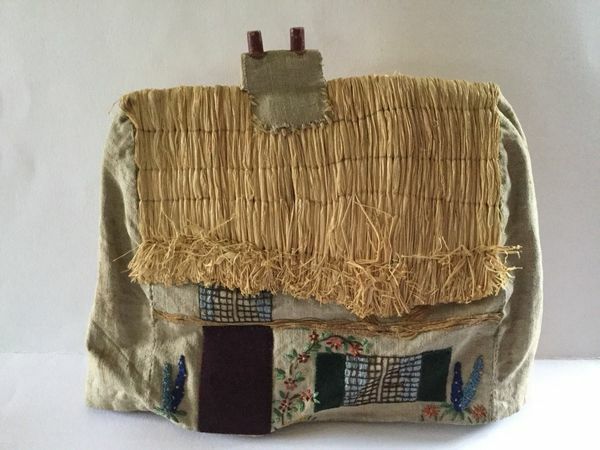 I like the many materials used to create it- not just embroidery and raffia (or straw) but also leather and the sign is wired and attached by what seems to be a drapery hook so that it stands straight out from the cosy. The chimney is fortified inside with a box (maybe cardboard?) so that it is stiff and not as subject to crushing. 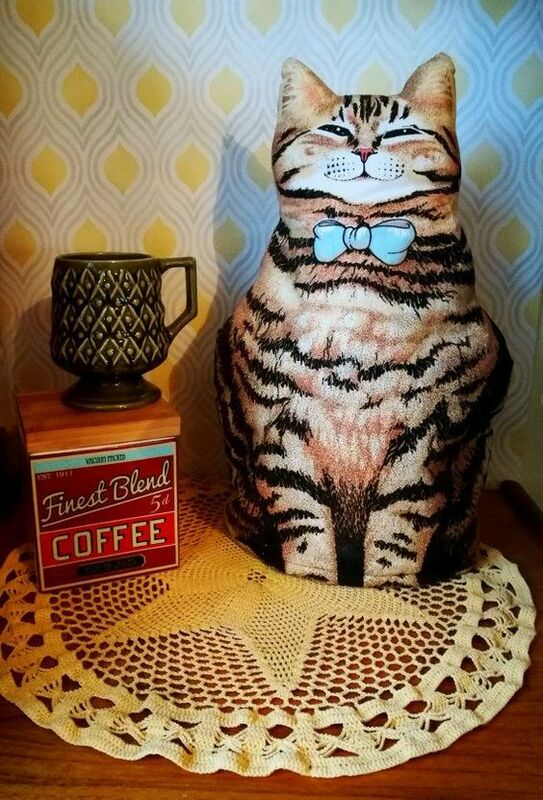 And I like the foaming mug on the bench beside the open front door. 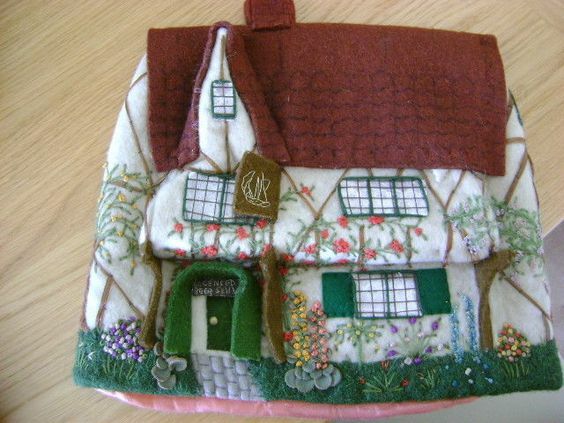 When I started collecting tea cosies, I wanted a cottage (specifically the cottage pictured in the Daily Mail). With this sort of collection, you can’t just hare off and start collecting anything called a ‘tea cosy’, you have to get a lot more specific or you’ll end up with a huge amount of things (definition of ‘horde’ varies but in this case, it would be a horde by any definition) and no money. Especially if, like me, you look for bargins. In my opinion, you should only collect the ‘best’ of whatever you are collecting- definition of ‘best’ left open to the user. 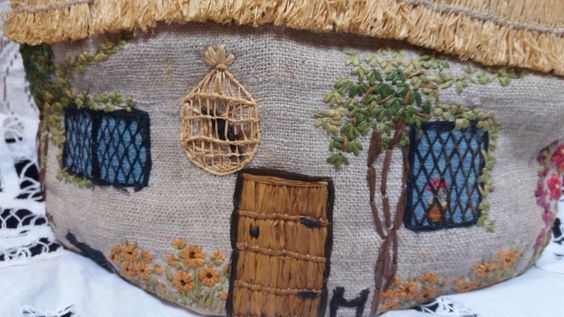 I narrowed my parameters to ‘cottage tea cosy’, not knitted or crocheted, preferably thatched roof with embroidery and unusual. Plus I have to really love it, not just ‘it fits the parameters’. 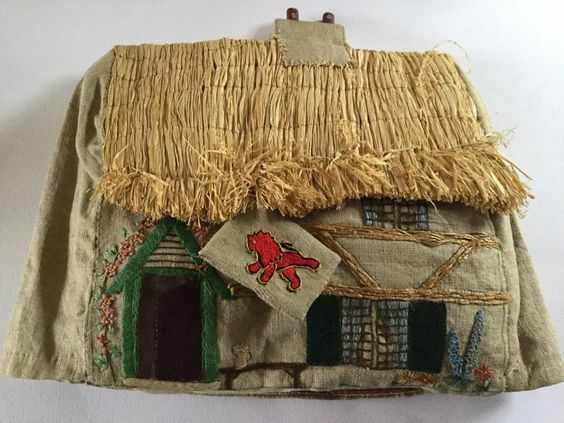 I’ve seen several printed cottage cosies but I’m only interested in one of them and the so-called Berlin work or tapestry cosies (needlepoint) don’t really interest me either. So, just by narrowing what I’m collecting, I’ve saved quite a lot of money and space.